A permanent residence refers to a government-granted permission, awarded to a non-citizen of the United States. Those who receive permanent residency acquire the legal right to reside within the United States on an indefinite basis. The recipient of permanent residency is not subjected to the stipulations latent in a Visa; a Visa is subjected to expiration. An applicant for a Permanent Residenceis awarded the opportunity to be sponsored by an employer. This process, not only ensures the candidacy of that individual, but Permanent Residence sponsorship can also expedite the application process. An applicant for Permanent Residency maintains the opportunity reside permanently in the United States through the legal and authentic marriage to a citizen of the United States. Citizenship in the United States of America, offers the individual in question to enjoy the various freedoms and rights expressed in the United States’ Constitution. As a result of these liberties, a United States citizen in turn, is expected to uphold the responsibilities of being an America citizen, in conjunction with all applicable legislation set forth. Citizenship is granted subsequent to 5 of residing within the United States. During this time, the applicant is expected to minimally travel or reside abroad. Adult applicants who have met the requirements of permanent residence will be allowed to participate in a Naturalization Test. This test will ask basic questions regarding America’s history and question their ability to assimilate to the norms of American society. Form G-325:This form must be completed to, provide official documentation, report, and record of the non-citizen’s biographical information. 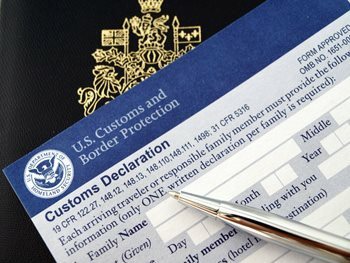 The form G-325 must be completed prior to the fulfillment of the Green Card application process. Form N-400: The form N-400 must be submitted in the event that an individual who has received a Green Card and has been approved to participate in the application for Permanent Residence. This form is ten pages long, and possesses a fee of $595. In certain cases, however, a biometric analysis fee can be incurred. This fee is required to initiate a background checkin the amount of; background checks are administered within regions that include mandatory biometric testing. As a result, the final processing fee can total $680. Those individuals who experience complications in regards to the obtainment of permanent residency should contact the United States Citizenship and Immigration Services Bureau. This government department can be contacted through their toll-free phone number: (800) 375-5283. By contacting this agency, the individual can learn about additional requirements, the expedition process, various requirements, and supplemental pieces of legislation. Additionally, if an individual would like to seek the aid of an attorney, they should contact an immigration lawyer. These legal professionals are well-versed in the ever-changing and complex laws which circumvent immigration processes and the obtainment of a permanent residency.